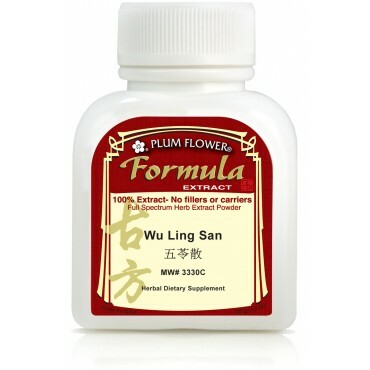 Diuretic to dispel damp in edema, ascites and watery diarrhea, wind damp bi-syndromes characterized by heaviness of the limbs. May include vomiting of fluids, headache, dizziness, shortness of breath or difficulty urinating. Water accumulation due to kidney or heart disease including congestive heart failure, nephritis and abdominal ascites due to liver cirrhosis are some of the imbalances satisfied clients have used this product for. Alisma orientalis rhizome, Poria cocos fungus, Atractylodes macrocephala rhizome, Polyporus umbellatus fungus, Cinnamomum cassia twig. - Ze xie, Fu ling, Bai zhu, Zhu ling, Gui zhi.